As part of an ongoing request for decentralized infrastructure, Aion Network looked to companies such as BlockX Labs to build-out different pieces that tie the Aion ecosystem together. BlockX Labs, a Toronto based blockchain development firm — has partnered with NodeSmith and the Aion Foundation to produce AIWA, a browser-based wallet for AION Coins. AIWA features a convenient dashboard to select your network, select your active wallet, view outgoing transactions, and view more details about your holdings and tokens. Read the full blog about AIWA here. BlockX Labs was built by developers for developers. The original idea for the company was to build developer tools that developers can’t live without. The three founders (each with over 10 years of developing experience in fintech and startups) accomplished just that. So far, BlockX Labs have built a plethora of blockchain products: from a Decentralized, mobile-first Exchange for Genesis, to auditing smart contracts for TIP Blockchain. The team at BlockX Labs realized that the developer tools were not up to par in this space and they finally found a business model that would work take them back to their original vision: To build developer tools for blockchain so teams can build amazing applications that truly change the world. Chinmay Patel is a tech leader, public speaker, and a serial entrepreneur with over a decade of team building and product development experience. His experience spans over several technical landscapes such as: enterprise system integration, artificial intelligence, voice technologies, and blockchain. He is currently the founder and CEO of BlockX Labs and works with his clients to help them explore the full potential of blockchain technologies. He also helps clients build strategies to apply innovative blockchain solutions to solve their current problems. 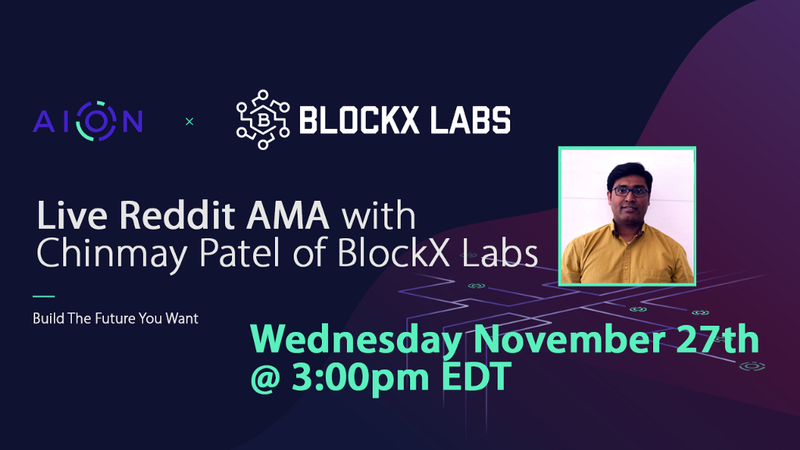 BlockXLabs’s co-Founder and CEO Chinmay Patel will be our guest in for live AMA on the Aion Reddit Channel at 3pm EDT Nov 27th. He welcomes any and all questions about BlockXLabs, AIWA and BlockXLab’s relationship with Aion & Nodesmith. Live AMA with BlockXLabs’ Chinmay Patel on November 27th at 3pm EDT was originally published in Aion on Medium, where people are continuing the conversation by highlighting and responding to this story. Aion Virtual Machine (AVM): Why Java and the JVM?